Here's my card for the current Share Joy challenge. 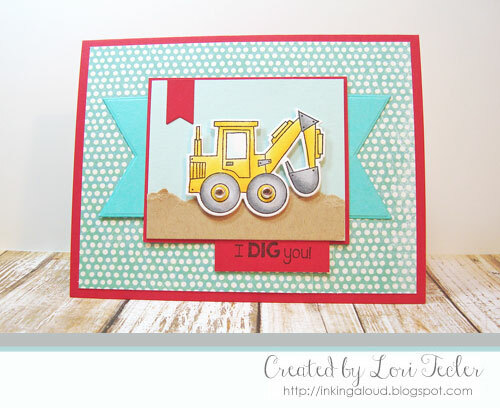 I used the Taylored Expressions Dig In stamp set and coordinating dies along with both the sketch and color combination on my card. I used Copic markers to color the excavator (at least I think it's an excavator . . .), then cut out the image with the matching die. To add dimension and a metallic shine to the image, I placed a silver brad at the center of each wheel. The image was adhered to a light blue panel with a strip of torn kraft "dirt" along the bottom. After adding a red banner strip to the top corner of the panel, I matted it on red cardstock. The set's "I dig you" sentiment was stamped on a red cardstock strip and adhered to the bottom edge of the panel. I added an aqua double ended banner strip beneath the image panel, then adhered it to a red card base covered with some coordinating dotted aqua patterned paper. What an adorably cute card!